Perfect for todays’ busy parent, the Doona™ car seat Sky (Blue) surpasses every safety standard both in its primary function as a car seat and when converted with just a click of a button into a stroller. Incorporating deep double walled side impact protection, orthopaedic inner cushion, and anti-rebound technology, the Doona™ is also larger than most of its peers meaning that your infant can remain in the safest form of car seat for longer. Easily secured using your 3-point seat belt, the Doona™ can also be installed with a Doona™ ISOfix base for added safety and convenience. What sets the Doona™ apart and above every other car seat on the market however, is when you leave your car. The Doona™ is the world’s first infant car seat with integrated wheels meaning that in less than ten seconds you can be out of your car with your precious little one and on your way in safety and style. No longer will you have to take up valuable boot space with a cumbersome travel-system frame, struggle in the rain while trying to unfold or fold your base, or balance your infant seat in your arms with bags of shopping. 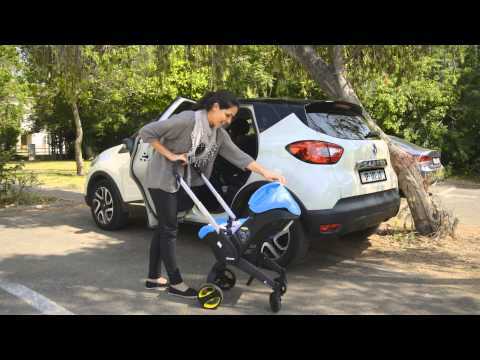 Whether you’re nipping into the petrol station, picking up a latte, running into the supermarket for some fresh milk, or travelling through an airport, the Doona™ is truly the next generation in parent and child mobility. Available with a full range of accessories from rain-covers to matching Essentials and All-Day Mummy Bags, the Doona™ is the world’s first car seat to offer style, comfort, mobility, and safety all in one package.